It was one week before Halloween that the Pizza Hound and I decided to make trip to just across the state line to Northwest Indiana, an essential part of the Chicago area. That morning he could hardly wait for the evening pizza run, but unfortunately I had to go to work for the day. Our planned destination? Dino’s Pizza, a local place in the small and very interesting city of Whiting. Whiting is an industrial powerhouse in the Region, and, as we found out, a pretty neat little town. Okay, but first I had to get a quick photo with the greatest hound in the world…even if that hound is already on his way out the door. It was a beautiful autumn night, and we wanted to enjoy the weather as best we could. Fall is our favorite season by far, and we were in the mood for a long drive–a drive that gave us the opportunity to the get away from the hustle and bustle of the busy work week. Whiting is actually not far away, but with the occasional crawl of Chicago traffic its definitely outside of pizza pickup distance for most people. From the house in Logan Square we headed down Kedzie to Grand then to Chicago Avenue, which we took all the way to US-41, the famed Lake Shore Drive. From one corner of the map to another: Logan Square to Whiting via Lake Shore Drive. Source: Bulk Petroleum Co. Chicago and Vicinity travel map. Rand McNally & Co. c.1950s. Once on Lake Shore Drive, we felt the immense darkness of Lake Michigan to the left, but also the enormity of one of the world’s great cities to the right. At that moment, it feels like you are on the edge of the earth, and grateful to enough to be able to hold onto life in its capital. This massively blurry picture–like a hazy dream–fails to capture the feeling of transcendence you can experience when you see that beautiful skyline and know that it is your home. Sure, Chicago ain’t perfect. It has plenty of problems, and it benefits some more than others, but when all is said and done, you feel very lucky and proud to be a Chicagoan at moments like this. Or at least we felt that way. As lucky as we felt in that moment, we are reminded that so many people across the city that don’t feel so lucky to be there–or even trapped there–and with good reason. Traveling all over the city can help one keep some perspective on what Chicago means to different people, if only in a very small, somewhat insulated way. But, at that moment, there was no denying to us that it was beautiful, and there’s plenty of fantastic pizza among those tall buildings. Lots of classic Chicago deep dish, and probably crazy long lines and large groups of wide-eyed tourists to go with it. We love that stuff, but our mission was about 15 or so miles down the road. So, we continued down Lake Shore away from the sparkle of the Loop. Around the Soldier Field and McCormick Place, Lake Shore opens up, and the cars start speeding a bit. Once you get to Hyde Park and South Shore, though, the road narrows to two lanes, still hugging the shoreline for the most part. Moving through the left the of the radio dial, we picked up a high school football game broadcast coming from Northwest Indiana, which only enhanced the great autumn mood. At 79th Street in South Chicago, we hopped on the new four-lane southern extension of Lake Shore Drive which gave us a quick, smooth drive through the massive former U.S. Steel South Works site, still mostly vacant awaiting promised developments that have yet to come. Soon, Lake Shore Drive ended and we continued south on the two lane Ewing Avenue. Through South Chicago and the East Side–Southeast Side neighborhoods that serve as counterparts to Northwest Indiana both in history and regional character, we passed a few pizza places such Avy’s, Pucci’s, and Route 66. There’s Maya’s and Capri’s on Commercial Avenue, too, and Waldo Cooney’s and Gusi’s are over there, as well. The hound’s nose led us forward despite the tasty distractions. Just after traveling underneath the Skyway, we made a left on Indianapolis Boulevard, the lifeline that would take us to our destination just a few miles down the road. Soon we saw a sign that said “Welcome to Indiana,” and we knew we didn’t have much farther to go. There, on piece of road that is particularly jarring to one’s senses, we passed the Horseshoe Casino, cheap gas stations, fireworks stands, and the odorous Cargill plant. The landscape there is flat and undefined, likely reflecting the swampland and dunes that characterized the area before industrial development hid them somewhat from view. Source: Bulk Petroleum Co. Chicago and Vicinity travel map. Rand McNally & Co. c.1950s. That odd small piece of land falls with the city limits of Hammond and owes its existence within that city to annexation battles between various Region communities in the 1890s. Residents in the area of present-day Whiting resisted incorporation, allowing Hammond city leaders the opportunity to annex the Roby and Robertsdale communities, among others, which gave Hammond this thin strip of land with access to Lake Michigan. The proximity to Whiting and geographical distance and separation from Hammond proper (which was actually located several miles to the south down present day Calumet Avenue), as well as the the historical and official government connections such as postal and phone codes to Whiting, have apparently long made the area disputed territory in local lore. After crossing this barrier-like stretch of land, we arrived at a strip of businesses on Indianapolis Blvd. that eventually leads to the businesses of Whiting. Whiting is a small city that borders Lake Michigan, an advantage that gives it excellent industrial and shipping opportunities that were only reinforced by railroad lines through the area. On land, the city is surrounded by (as mentioned before) the somewhat L-shaped Hammond and the city of East Chicago, both of which have historically been home to a number of industries, including steel production. In fact, the major man-made Indiana Harbor and Ship Canal is located in East Chicago. But we weren’t going that far east, nor that far south into the heart of Hammond. Continuing to travel southeast on Indianapolis Blvd., we reached Whiting proper, where we encountered a number of restaurants and older divey taverns. A few blocks south of the older main street section on 119th Street, we headed east on 121st Street. In a corner storefront tucked in the neighborhood, the pizza beacon Dino’s is located where the street meets White Oak Avenue. Dino’s began its five-plus decade run as Baker Boys Pizza and opened for business in 1961. This location on 121st is Dino’s second location, with the original on the other side of town to the west on Calumet Avenue (in Hammond? I can see where this can be confusing…), at an address the is the current home to Gusto’s Pizza. Check out these classic Dino’s menus from the official Dino’s website. By the time Ernie and I made it there that Friday night, Dino’s was pretty quiet. No doubt most of their business was carryout and delivery, though, as evidenced by the couple of delivery drivers hanging out waiting for their next runs. Attesting to the Region’s connection to the big city just a few miles away, Chicago sports posters adorn the walls of Dino’s fairly simple red, white, and black dining room (Go Hawks!). That’s the pickup window in the back. The lights from the huge BP oil refinery, a huge employer and the primary driver of the economy in Whiting, sparkle just a few blocks from Dino’s. According to the Encyclopedia of Chicago, the refinery was opened in the 1890 by the Standard Oil Co. of Illinois, and has defined local character ever since. In the mid-1890s, when leaders from Hammond annexed Robertsdale and Roby, they also made a move to annex then-unincorporated Whiting, with a planned attempt to eventually annex the refinery in order to access its tax revenue. However, this play was met with strong with resistance from Standard Oil, who blocked the annexation of Whiting by Hammond, and later advocated for the incorporation of Whiting and succeeded, ensuring the placement of the refinery within the bounds of the Whiting community. While Ernie and I can only speculate why Dino’s moved from its original location on the busy drag of Calumet Avenue, the pizza joint likely benefited from its newer location, from which workers could leave a shift and pick up dinner on the way home from the refinery. In fact, two of the other corners at 121st and White Oak have buildings that appear to have been former or currently vacant commercial buildings. Perhaps the intersection an active point of commerce–or at least home to a tavern–years ago. Here you go…nice and blurry! Homes bordering the refinery are a mix styles and building materials, but mostly of modest design and construction, and mostly one or two stories tall. Many of these working-class frame houses are built very close to street and may have been built by Standard Oil. Some house have a small lawn in front. There are some bungalows, too, that were likely built a few decades later. Farther to the west–Whiting is relatively small with just under 5,000 residents living in three and a quarter square miles, so “farther to the west” is just a few blocks, and I suppose in this case, in Hammond–some streets are lined with homes that appear somewhat more affluent, with fancier designs, brick construction, and curving streets. This brick house, however, is located in the vicinity of the refinery and Dino’s. Many streets were packed with houses, some with strands of orange Halloween lights. The older style streetlamps that line the streets are notable, as well. No doubt, a lot fear ran down this block during the huge refinery explosion in 1955. The resulting fire burned for eight days, resulted in two deaths, and damaged about 200 homes. Scary stuff. The refinery has had many incidents over the years, including a few–though still potentially very dangerous–fires. Here’s some footage a smaller one that happened in 1984. Action shot! Another former corner storefront can be seen on the right. These types business were easily accessible community resources before the rise of automobile ownership, especially in a densely-populated industrial community like Whiting. 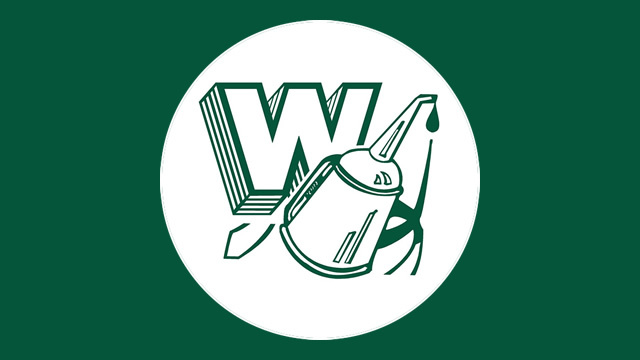 Attesting to the place of the oil refinery in the local economy, the Whiting High School students represent their school and town in a number of sports as the Oilers. The school’s football has a storied history, too. 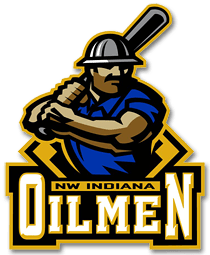 For professional sports, Oil City Stadium, home of the Northwest Indiana Oilmen minor league baseball team, is not too far away either. Land for the stadium was donated by the Standard Oil Co., and the stadium’s official website sums up the connection of the refinery to the community nicely: “The BP Refinery, located just beyond the outfield fence, is a constant reminder of the blue collar attitude this town was built on.” Blue collar, hard hat, huge muscles…he only needs a pizza to complete the picture. A large percentage of Whiting’s population are involved in manufacturing and related industries, and steel mills in East Chicago such as ArcelorMittal are draws. LTV Steel used to be there, too. And with a historically industrial communities, comes a lot of taverns. Midtown Station, one of the many taverns in Whiting and in the region, located north of Dino’s at New York and Fischrupp avenues. A longtime primary retail district, 119th Street, is lined with a number of two- and three-story commercial buildings housing new and old businesses. There are some great pictures on the Whiting-Robertsdale Historical Society (one case of Whiting residents holding on to Robertsdale…the two areas share a chamber of commerce, too) site of parades and events on 119th Street and across Whiting. The Whiting Public Library site has a great information on the history of Whiting, as well. The grand historic Hoosier Theatre, the only remaining theater of its kind in Northwest Indiana, is located on 119th Street. The several hundred-seat theater, which opened in 1924 with Vaudeville performances, cartoons, and organ-accompanied feature length films, was restored in the 1990s. Today, one can go see Hollywood’s biggest hits on a giant screen and in a building that has been placed on the National Registry of Historic Places. Not only had the Hoosier Theatre been restored, but this main street appeared to be in good shape, and most of the properties appeared to be occupied. It’s evident the street has either never witnessed a large decline like many main streets across America, or more likely, has seen a lot of purposeful recent redevelopment focused investment. A number of people were out walking and enjoying the evening, and it appeared that the street had been closed off for an event. Likely, the streets were closed for the beginning of local Halloween festivities. These included a family-friendly parade the next day that ran on 119th and ended at Oil City Stadium (where treats were available!) and locally-run haunted hayrides at Whihala Beach, where the skyline of Chicago can be seen in the dark distance across the lake! Apparently, the concessions at the hayrides were sponsored by the local Beggars Pizza franchise, giving the world yet another example of how pizza benefits the communities. Whiting holds another festival earlier in October called Wickedly Whiting to celebrate the beginning of the Halloween season, and the city celebrates the Eastern European heritage of many of its residents, too, by hosting to well-attended Pierogi Fest each summer. Here’s one of the many small businesses on 119th Street, Sun Catchers Stained Glass. We got the impression that Whiting is a great town. It has a classic small company town feel, but when you are on 119th Street, you could easily forget that that giant company looms just a few blocks away. That is, if you did not depend on it for a living. As interesting as Whiting was, eventually we needed to return to Chicago, and after driving around exploring a bit, Ernie and I decided it time to retrace our steps and head home. So, we jumped on Indianapolis Boulevard and flew up Lake Shore Drive back to the the big city. It’s hard to see in the picture below, but there’s a hound there waiting to get back in the Logan Square apartment to taste our Dino’s pizza. The long trip, we found, was well worth it, not just to experience Whiting but also–and most certainly–to enjoy our pizza. Our extra large all pepperoni, half sausage pizza came on a cardboard circle covered with a paper bag. Though I am no authority on the subject, I have to say that the Chicago area is the only place I have seen this type of pizza packaging commonly used instead of pizza boxes. Even Pequod’s on Clybourn used to house their massive pan pizzas like this up until a few years ago. Do they do this in other regions? Menu deals for the month. Happy Halloween! Loyalty is rewarded at Dino’s, too. Collect 20 coupons for a medium cheese and sausage pizza. Again, sausage proves to be the most popular topping in the Chicago area, even extending out to Northwest Indiana. You could almost call it the “default setting” pizza. Why does the cheese need to be mentioned, by the way? This was not the first time we wondered that question while exploring a pizza menu. Also attached to the bag was a flyer for an upcoming performance of Shrek: The Musical at a local church. The production was presented by the Marian Theatre Guild, a theatrical group based in Whiting that dates all the way back to 1926! It’s pretty remarkable that a city the size of Whiting would have a guild at all, much less one that has been producing shows for 90 years. It’s even more notable that it is based in a city where the local economy has been focused on heavy industries much of its existence. Now to the pizza! We carefully slid the pizza out and were very happy with what we saw and smelled. Chunks of sausage and a generous helping of pepperoni sat on top of the cheese. The crust was thin, but not ultra thin like the venerable Vito & Nick’s. The crust was also crispy, with a nice ring around edge giving me a nice grip and leaving plenty of scraps for the Hound. The proud hound posed in front of his treasure before we dove in. He really earned this one. Even traveling across the state line could not distract him from his goal. Of course, if not for him, I could not have found this great pizza. So he got the first piece! Crust and a nice amount of sauce on a perfectly hound-sized bite. Nice looking squares of pizza. The sauce was dark, rich, and a bit tangy. Very good stuff. The cheese was nice and stringy, if only a touch oily. Delicious. Dino’s offers deep dish pizza, as well, and the Dino’s Special is a standard Chicago special with sausage, green pepper, mushroom, and onion but adds pepperoni. They also offer other specialty pizzas such as a Taco Pizza, a Hawaiian Pizza, and something called a Four Seasons Pizza. We definitely enjoyed our sausage and pepperoni, though. After yet another successful pizza hunt, Ernie was so tired! C’mon Ernie, it’s not like we had to work all night at the refinery. Oh, well…pizza houndin’ is hard work. With a full belly, he curled up on the couch to rest for the night. It was a great trip to Dino’s, and they served an excellent tavern cut, Chicago-style thin crust pizza. It’s well worth picking up if you happen to be in the Region. Ernie and I had so much fun in Whiting that when the Pizza Hound woke up the next day he continued to enjoy the fall weather and was excited for a possible Saturday night pizza run. We knew we would go back to the Region soon. There was even another pizza place our list to try in Whiting…or is it in Hammond…I guess it’s up for debate (or not)! But there certainly is no debate that our trip to Whiting and Dino’s Pizza–hidden in the neighborhood near the lights of the refinery–was exactly what we needed on a cool fall Friday night.